« Happy New Year, E’ybody! My first published story without a lick of science-fiction or fantasy is now available through Midwestern Gothic (ISSN 2159-8827). It’s about a man who feels trapped by his own life, a life he isn’t even good at. Pick up a paper-and-ink copy here, or if you want an electronic copy (PDF, Kindle or Nook) click here. 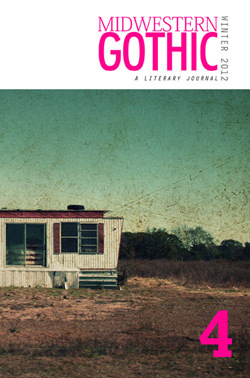 Midwestern Gothic is a quarterly print literary journal out of Ann Arbor, Michigan that features the work of Midwestern writers–and let’s face it, there are a lot of us here. We don’t get the same kind of press as the East and West Coast, and even Southern writers have a higher profile, for some reason. Not that there’s anything wrong with literature coming out of those places–it’s just nice to have a magazine dedicated to giving the Midwest a voice. This entry was posted on January 2, 2012 at 6:58 am and is filed under News. You can follow any responses to this entry through the RSS 2.0 feed. You can leave a response, or trackback from your own site. Anyway, congratulations on what seems to be just one of several successes you’ve had. I’ll have to peruse further. You’d think in this day and age, regionalism would have gone the way of the dodo, but perhaps not, and I for one think it’s great that we can still get regional flavor, not just in our food, but in our reading as well. Unfortunately, I think politics and entertainment will always keep us departmentalized. And while I appreciate the nod, I’m curious what you think I’m doing right at my blog (because I’ve just been winging it… and often wonder if I’m screwing it up).